A composite deck is an attractive, practical, and long-lasting addition to just about any yard. However, keeping it attractive and making sure it is as long-lasting as it can be will require a little bit of cleaning and maintenance now and again. This does not have to be difficult or particularly hard work, as long as you do it right and don’t neglect the job for too long when it is needed. You can help keep your deck looking its best with a simple, regular clean. This can also delay the need for any kind of deeper, more serious clean. This can be as simple as using a stiff brush to sweep off loose dirt and debris, which you could do as often as once a week. If there are any stains or smears of dirt that don’t seem to warrant any specialist treatment, you can probably tackle them with a gentle detergent, water, and a little scrubbing from a stiff brush. 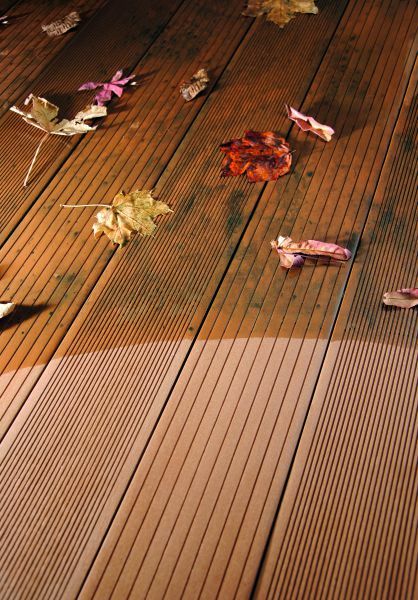 Like any kind of outdoor wood, composite decking is prone to fading and discolouration over time. Sunlight, water, and changing temperatures will all take their toll on the wood, and dirt will slowly work its way into the grain where it will not be easily shifted without some kind of specialist treatment. This is when a more powerful and more dedicated decking cleaner will become necessary if you want to restore your deck’s good looks. Choose a purpose-designed composite decking cleaner that will penetrate the wood for a deep clean both upon and inside the grain of the wood. You might like to choose a product like Compo-Clean, which is usable straight from the bottle, is water-based and safe for the environment, and uses a gel formula to prevent the dripping and run-off associated with most cleaners. You should use your cleaner according to the instructions on the bottle, but usually this will involve applying to the decking with a brush, leaving it to act for a certain amount of time, and then rinsing it off with clean water. 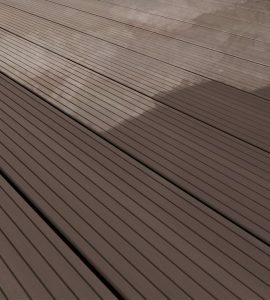 Even the best decking cleaner can’t undo all of the toll that weather and sunlight will take on your composite decking, especially if it has heavy foot traffic or is in an exposed area or in a particularly sunny climate. More importantly, over time repeated exposure to water and changing temperatures can cause the wood to weaken and crack if it’s not properly protected. You can prevent this and also restore the wood’s appearance more effectively by using an appropriate composite decking care product after cleaning your decking. A decking care treatment will help to protect your wood and seal it against the weather, and will also help enhance and restore the color of the wood. Compo-Care, for example, will provide a weatherproofing and stain-repellant finish in just one coat and is available in brown. Like Compo-Clean, it is a water-based formula that is safe for the environment. You can apply most composite decking care products straight from the tin by simply applying them to the wood with a brush or roller.